On the heels of a victory in Oregon, an unlikely coalition of activists set their sites on blocking coal transport in Washington state and beyond. There is an adage commonly spoken in many activist circles: Think global, act local. And several communities across the Northwest, linked together in their opposition to coal transports by concern for the health of their communities and of the planet, are aiming to do just that. As such, blocking these terminals has been called “just as important as KXL [the Keystone XL pipeline]” by Bill McKibben, who says it’s “one of the most crucial fights for American climate activists to win.” And winning they are, thanks to the collective efforts of seemingly disparate communities, all of which are concerned, for various reasons, with coal transport. The coalition, known as Power Past Coal, includes business people worried that dust will scare away customers, nurses alarmed by potential health impacts, and tribes aiming to protect ancestral lands, among others. One hundred and fifteen organizations comprise the umbrella group. 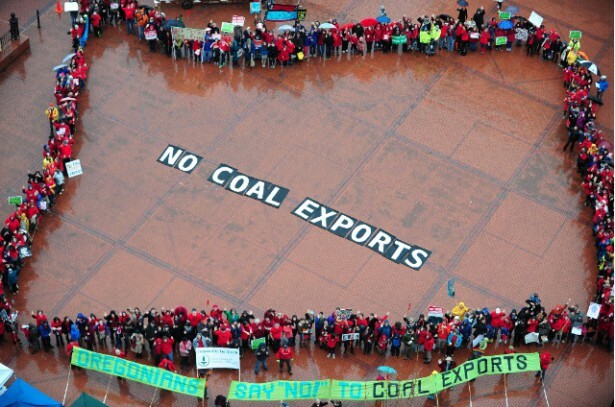 Just last month, the Oregon Department of State Lands, or DSL, denied a permit requested by Ambre Energy, which wanted to transport nearly 9 million tons of coal, every year, through the Port of Morrow on the Columbia River to Washington state and beyond. The victory came after a nearly four-year fight that included drawn-out obfuscation by Ambre, a call for rejection of the requested permit by 20,000 Oregonians and several elected officials including Oregon Gov. John Kitzhaber. Excluding the possibility of a reversal during the appeals process, the DSL’s decision is historic — it’s the first time a Pacific Northwest state agency has officially rejected a permit for a coal terminal. It also puts one more nail in an increasingly sealed coffin for Big Coal: While there were initially plans for six coal export terminals across the Northwest, only two remain in the works. Efforts from local tribes have been key to the successes thus far. Despite some tribes being offered substantial income from the coal companies in exchange for their support of the terminals, several have come out strongly against the companies’ efforts, concerned about the projects’ impact on the environment, generally, and traditional fishing grounds, specifically. It was this latter point that seemed to draw the attention of the DST. In their rejection of the permit, the agency wrote that the terminal could impact “a small but important and long-standing” tribal fishery, belonging to the Yakama. With the successful Oregon effort almost safely behind them, campaigners are focusing their efforts on two remaining proposed transport terminals in Washington state, which are much bigger than the one in Oregon was intended to be. Nearly 100 million tons of coal could be shipped annually from Longview and Cherry Point, Wash., to international shores. Small but significant successes have been won thus far. Because of strong state environmental protection laws that require well-advertised public hearings, governing bodies — such as the Army Corps of Engineers and the state’s Department of Ecology — heard from hundreds of thousands of concerned citizens. “There was an organic concern about these projects that led people to contact these agencies,” Doglio said. The agencies are now drafting environmental impact statements for both proposals, the outcomes of which will help to determine whether the projects go forward. Activists saw a key win when the Department of Ecology announced that in drafting the statements for Cherry Point, not only will the body look at potential local impact from the proposed terminal, but it will also consider the combined impact that the two proposals will have together — not to mention the impact that burning more coal in Asia will have on global warming — before making their final decision. If companies’ efforts are successfully blocked in the Northwest, they’ll likely consider going through ports in the Gulf of Mexico instead. But doing so will require longer and more expensive transport. “There are already proposals [there] and we’ve already been fighting them throughout the years,” said Laura Stevens, who works for Portland’s Sierra Club and has been a key organizer of the Power Past Coal campaign. To prep for the fight, Doglio has already traveled to Louisiana and Texas to help groups craft a strategy. There are also other efforts across the nation. Earlier this summer, Oakland’s city council voted unanimously in opposition to any transportation of fossil fuel materials along existing rail lines, as well as through waterfronts and densely populated parts of the city; similar resolutions have already been passed in Davis and Berkeley, Calif. San Francisco is also considering similar moves. Meanwhile, on the East Coast, the City of South Portland, Maine has passed an ordinance banning the transport of crude oil from train to boat. And back along the rail route from the Powder River Basin to the Northwest, communities are raising their voice: a City Council resolution is in the works in Sand Point, Idaho, and an unlikely coalition of farmers, cattle ranchers, fishers and tribes are organizing in Montana. The Oregon victory has galvanized campaigners across the country. Cathryn Chudy, a local activist who has been involved in Washington since 2010, says that the strong show of public resistance thus far indicates that communities across the country can win. Mara Kardas-Nelson is an award-winning freelance journalist who writes on health, international development, the environment and social justice. Her work has been featured in the Mail & Guardian, The Globe & Mail, Al Jazeera and The Nation.